After 16 years of working at the one and only job he’d ever known, Mike Leah quit to pursue a career in poker. Many before him have taken the giant leap from the corporate world and the safety of a guaranteed paycheck to the unpredictable, ever-changing game of poker, but none with quite the ambition of Leah. His goal for his first year as a poker professional: win the Player of the Year award. So, how’s he doing? He’s currently in fifth place on the Card Player POY leader board with 3,137 points. Leah was born in Toronto, Ontario, on Oct. 15, 1974. With divorced parents, Leah split his time between his mother and father and grew up in an eclectic family with an older sister, younger half brother, half sister, and step sister. Despite moving frequently, Leah was able to foster a passion for sports, especially wrestling. In high school, Leah won the National Championship for his age group and weight class of 108 pounds. His senior year, he traveled to the World Championship with the Canadian National Team. Leah was a promising collegiate athlete, and was offered scholarships to any school he wanted to attend in the United States. During the summer after his senior year, Leah took a sales job at Canadian Community Reading Plan to save some money, and ultimately decided to take a year off to work, do some traveling, and rest his body of years of sports. At the end of his year-long hiatus, he decided not return to school because of the amount of money he was making at his job. Leah continued with the company and his ingrained ambitious and competitive nature carried him upward through the ranks. He worked his way up from sales rep to managing Western Canada, to managing Eastern Canada in Toronto. During the summer of 2005, a coworker introduced Leah to poker. He began playing online and in home games with his friends. As a manager, Leah spent much of his time working from home, allowing him to advance his growing passion for poker online. In 2006, under the screen name “GoLeafsGoEh,” he was grinding $5-$10 sit-and-gos, when he eventually won a satellite into the PokerStars Sunday Million tournament. On his first go at the staple tournament, Leah final-tabled, making $23,000 for seventh place. The very next weekend, he placed second in a $320 buy-in tournament for another $15,000. Leah admitted that, at the time, he didn’t have enough experience to be playing the bigger buy-in tournaments on the regular, and that he gave most of the money back over the following months. Through trial and error, and thousands more hands online, Leah began to get into the swing of things. He qualified for the 2006 World Series of Poker and traveled to Las Vegas for the first time to try his hand at live tournament poker. He busted on day 1 of the main event, but competed in the Bellagio Cup nightly $1,000 tournaments. Leah ended up chopping two of the events for a total of $100,000. After that summer, Leah returned to his job, but continued developing his game. During 2007 and much of 2008, Leah made numerous tournament cashes online. It was then that he was determined to put together enough money to be able to quit his job. In September 2008, Leah met some guys who offered him backing, finally giving him the security to let go of the his current career. Just after quitting, Leah traveled to the U.S. Poker Championship tournament series at the Taj Mahal in Atlantic City. In three preliminary events, he placed first, second, and fifth, and then took third in the $10,000 main event for more than $75,000. Not a bad way to start. At the end of 2008, Leah decided that 2009 would be his year. 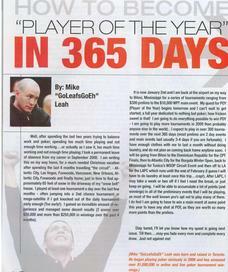 “Going into the first year of being a professional poker player, my goal was become player of the year. I wanted to see if I was good enough to compete with the best poker players in the world. I wanted to go balls out this year, if that’s the right term,” Leah said with a laugh. So confident in his skill, Leah even authored an article called, “How to Win Player of the Year in 365 Days,” on Jan. 2, saying that he probably would be playing more tournaments than anyone else in the world in 2009. He expects that number to exceed 300. This year, he’s accumulated more than $650,000 in live tournament winnings and made seven final tables with two wins. In March, Leah finished first in the $1,500 buy-in $500,000 guarantee at the Borgata for $320,000, and in July, he won a Deep Stack Extravaganza event at the Venetian for nearly $120,000. He’s accrued his POY points by the grinder method, consistently final-tabling smaller tournaments, but he hopes to snag a big score by year’s end. With little time for days off, Leah hasn’t a chance to do much else but poker. He’s put his personal life completely on hold, but that’s what he set out to do at the beginning of the year. 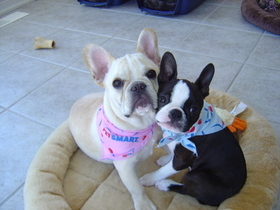 Leah says the toughest part about life on the road is being away from his “kids”— a French bulldog named Mango, and a Boston terrier named Johnny Cash. Without the security of a family to worry about, Leah said that it was a much easier decision to go after Player of the Year goals. Leah’s spent most of the year on the road, and plans to do the same for the next four months. Whether 2009 is his year or not has yet to be determined, but it is clear that Leah has both the talent and work ethic that any player-of-the-year candidate needs. The year-long competition is in its final stretch, and Leah, the rookie, is right in the hunt.